Posted 9/28/15 – The semi-annual Legendary Bingo fundraiser by the Sierra Madre Rose Float Association will take place Saturday, October 10th at the Rec. Center, in the Sierra Madre Room. 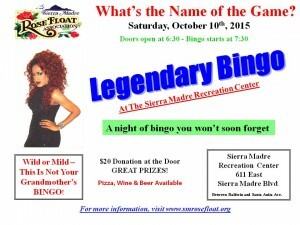 Doors open at 6:30, Bingo begins at 7:30. Donation at the door, $20. As always, there will be great prizes (mostly donated by local businesses and organizations), and beer, wine and pizza will be available for sale.